I’m sure you all remember the post that went along the lines of…. Rant Rant Rant, I don’t like golf, no old cars and maps Pheeeee! Anyway to those I offended, I apologise, see I did it! 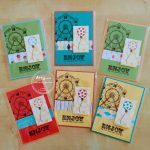 The story started like this, we’ve just had UK Father’s Day and of course it’s time to make another master piece, Atty’s been flashing about a rather exotic stamp set of a bottle, octopus and few other things which I’m fancying for my next card. 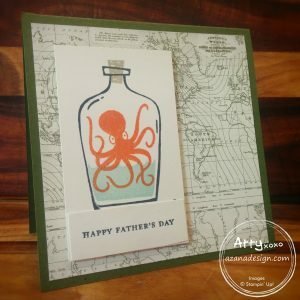 I stamp an almost perfect octopus in a bottle, everybody loves it but it needs some context as it looks a bit lonely on the card base. Atty then rushes to her *not* insignificant stash of paper and starts flipping through colours and textures and then boom I see it. It’s an old map, and it’s perfect! A few minutes later I have a masterpiece of a card, which I’m sure will be CASE’d (which is the polite word for copied excessively without credit) as it’s perfect for the dads everywhere. 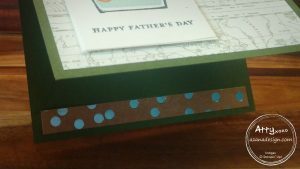 That’s not the end of the story… I have to mail the card back to the UK, so Atty powered by the envelope punch board bashed out a fantastic envelope in seconds using some paper with the history of the typewriter on it. Turns out that my Dad not only loves the octopus but also is now an expert on the history of a typewriter, having dismantled and read the envelope. So I confess, I’m just grumpy and Dads do love this stuff after all. That said I think he would have been happy with just the envelope! Oh and of course, the stamp set with the octopus he’s used is the great new Message in a Bottle stamp set. Assistant to the lovely Atty, provider of web resources, photography and all things interesting. 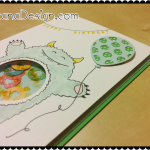 Assisting Atty in her Stampin' Up! endeavour here in Eight Mile Plains, Brisbane, Australia. 2 Responses to "I may have to apologise"
Great post Crafty Pete, have you thought about being an agony uncle for all the blokes out there suffering masculine cards in silence? Happy to critique the really special ones anytime.